I think these pumpkin patch cookies may end up being my favorite cookies from fall 2013. I sort of had an "aha moment" when they first crossed my mind, and was so excited to make them. I actually had a hard time finding any pumpkin mellowcremes, but was relieved when I finally did, even though they aren't Brach's:( I could have made my own pumpkins if need be, but this was so much easier. 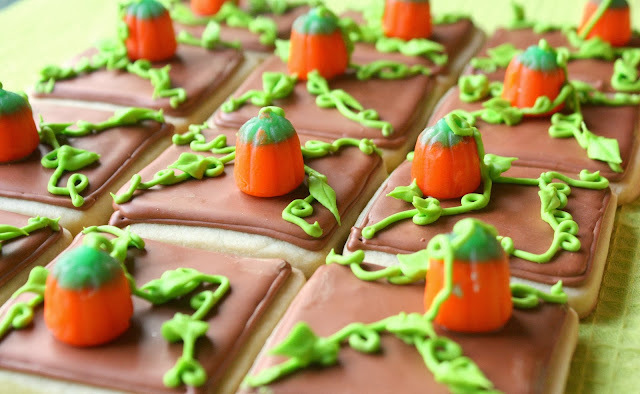 That's the beauty of these cookies; they are so easy to make! This year we didn't end up planting any pumpkins in our backyard garden, so these will have to make up for it...our own little tabletop cookie pumpkin patch. 1. Roll out sugar cookie dough. 2. Using a square cutter (mine was 3-inches), cut out the cookies and place on parchment lined baking sheet. 3. Chill for about 10-15 min. in the freezer to prevent spreading. 4. Bake according to recipe. Let cookie cool. 6. Tint some of it brown and some of it green. 7. Fill an icing bag with the brown icing fitted a #3 tip. 8. Outline each square cookie with the brown. 9. Let dry for about 15 minutes and then fill in the cookie with the brown icing. 10. Let cookie dry completely. 12. Place the green icing in a decorating bag fitted with a #3 tip. 13. Make the vines in a freehand design around each pumpkin. 14. Add leaves with a leaf tip (mine was #352). 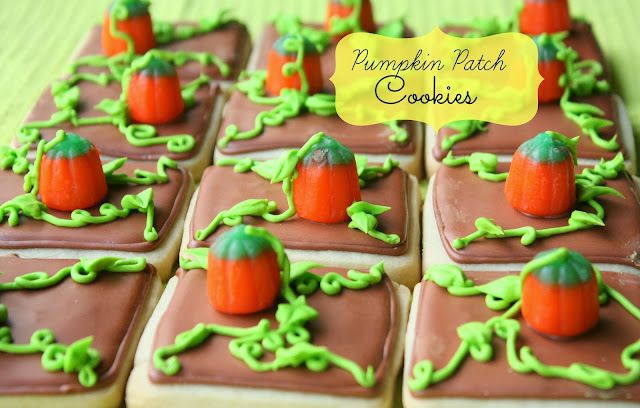 To display: Place cookies side-by-side (flush) in rows (all touching), on a platter or serving dish, to resemble a pumpkin patch. Glad you like it, Paulette. These are definitely NOT going to last long....they look way too yummy! Munch* Munch* Ohhh I wish I could have one! you've done it again, simple but so stinkin cute. My kid told me the other day he'd really likes cookies better than cupcakes. Guess that was a hint! Very nice! I'm admiring and enjoying... and wishing I had one of these cookies to consume, right about now! I love ideas that are simple and stunning and you did both with this set! I love them!! Thanks for sharing! What great Fall and Halloween cookies! They are so cute! These are adorable!! You did a great job. These cookies look AMAZING!! Pinning this recipe, thank you! As I said on your FB, I flippin' love candy corn/mellowcreme and I love how simple and adorable these are!! Awesome idea, Sue! Creative, smart, and super fun; much like all of your designs! Thanks for your sweet words, Michelle! Super adorable and so simple. Just LOVE this idea! Genius as always, Sue! wow I am speechless once again at your amazing cookie creation, Sue. 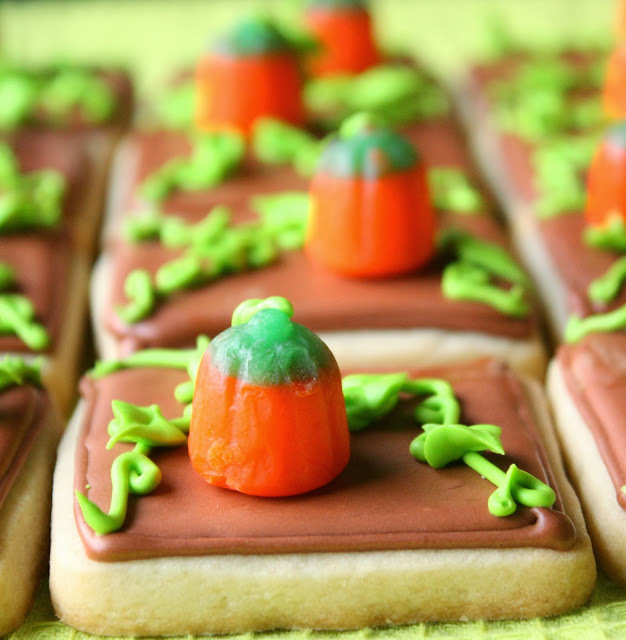 These pumpkin patch cookies are totally adorable! Oh my gosh! How totally cute are these! Awww, thanks for your sweet words, Heather!